Introducing the Incredible CarPro Gloss Pad... For Extreme Gloss! The CarPro Gloss Pad is made of a unique Japanese open cell polyurethane foam specifically designed for finishing to a high gloss on many paint types! The incredibly "fast rebound" foam makes it ideal for use with both Dual Action AND Rotary machines. The dense urethane interlayer provides the ability to easily maintain even pressure over curved surfaces whilst allowing vibration to be absorbed BEFORE it reaches the polishing surface. This in turn allows the abrasives to do their job without the vibration affecting performance of finish. The beveled profile allows the face of the pad to contour out away from the backing plate providing an extra level of precaution around tight spots. If extreme gloss is a priority the CarPro Gloss Pad is must! Extreme Gloss Pads for Intense Reflections! 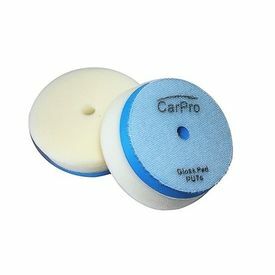 Polishing Face Diameter: 3 1/2"
Hook & Loop Diameter: 3"
When polishing, clean your pad after each section with your Foam Pad Brush before applying a couple more drops of polish for the next section. CarPro Gloss Pad 3" Introducing the Incredible CarPro Gloss Pad... For Extreme Gloss! The CarPro Gloss Pad is made of a unique Japanese open cell polyurethane foam specifically designed for finishing to a high gloss on many paint types! The incredibly "fast rebound" foam makes it ideal for use with both Dual Action AND Rotary machines. The dense urethane interlayer provides the ability to easily maintain even pressure over curved surfaces whilst allowing vibration to be absorbed BEFORE it reaches the polishing surface. This in turn allows the abrasives to do their job without the vibration affecting performance of finish. The beveled profile allows the face of the pad to contour out away from the backing plate providing an extra level of precaution around tight spots. If extreme gloss is a priority the CarPro Gloss Pad is must! Features: Extreme Gloss Pads for Intense Reflections! Super Soft open cell Japanese foam Dense Foam Urethane Interlayer High strength adhesive Bevel profile Specifications: Fabricated in: Japan Assembled in: China Polishing Face Material: Open cell Polyurethane Polishing Face Diameter: 3 1/2" Hook & Loop Diameter: 3" Total thickness: 1 1/4" Color: White Polishing Foam: 3/4" Thick (White) Dense Urethane Interlayer: 3/8" Thick (Blue) Velcro Color: White Cut: 1/8 (Light) Finish: 8/8 (Glossy) Quantity: 1 Polishing Tips: Fasten pad to machine taking care to securely center it on your backing plate Follow polish dependant tips Avoid overworking an area and do not hold pad still in one place When polishing, clean your pad after each section with your Foam Pad Brush before applying a couple more drops of polish for the next section.